Conversion tracking is the most important and valuable aspect of digital marketing. It lets you track the actions on your site that drive value for your business, whether those are purchases, content downloads, lead form fills, or video views. Without it, digital marketers would be spending money blindly and probably losing their jobs in the process. If you’re advertising on Twitter, you probably want to know if your promoted Tweets are actually getting you a positive ROI, right? Or if you have several campaigns using different targeting options, you’re probably wondering if your follower targeting campaign is more or less efficient than your keyword targeting campaign. Luckily, Twitter has two solid conversion tracking options that let you measure the success of your paid campaigns: the Universal Website Tag and the Single Event Tag. Interested in learning more about the basics of website tagging? Check this article out! Twitter’s primary form of conversion tracking is done through it’s Universal Website Tag. Similar to the Facebook Pixel and Bing UET tag, Twitter’s Universal Website Tag is placed on all pages across your site (before the </body> HTML tag). Once the tag is implemented, you can track conversions when users reach specific URLs, like a “thank you” or “confirmation” page. Additionally, you can create re-marketing audiences once the tag is implemented. Twitter will then provide you with a code snippet for you to place on all pages of your site. This is really easy to do with Google Tag Manager or any other tag management platform. As I mentioned earlier, Twitter’s Universal Website Tag lets you track conversions on certain URLs. Let’s run through a scenario: tracking whitepaper downloads on a confirmation page. Here you can select the type of conversion you want to track (purchase, sign up, download, site visit) along with the type of tag you’re using to track it. In this case, we’re tracking a download with the universal tag that was just placed on the site. Additionally, you can specify the URL that you want to track. The most reliable option is to select URL contains, then insert the unique portion of the URL. Since we’re tracking the whitepaper download, that URL can be “whitepaper/thank-you”. 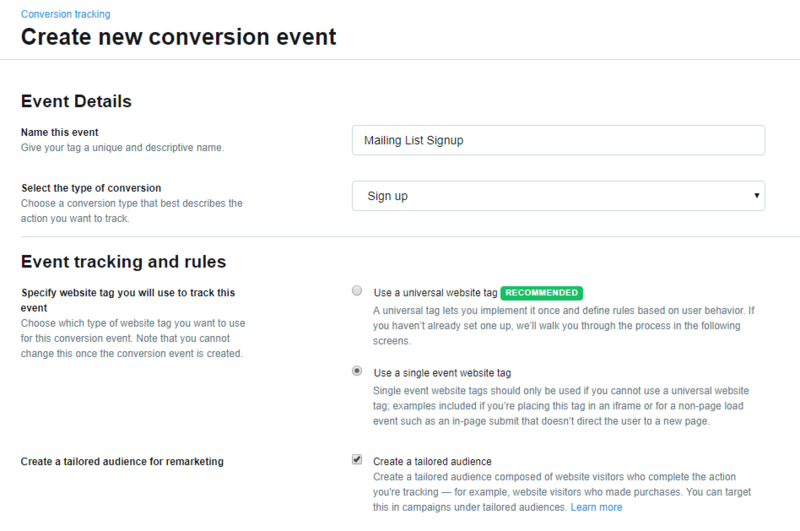 Once you save the conversion event, a conversion will be tracked whenever someone reaches that specific URL after clicking on your Twitter ad. Note: If you want to track purchase revenue to determine campaign ROI, you need to modify the universal code on the purchase confirmation page so it pulls in order quantity, currency, and value. Twitter has more info on that code modification in the advanced conversion tracking section here. Twitter’s second tracking option is done through the single event website tag. This form of tracking is mainly used to track non-page loading events, like a button click. I’ve chosen sign up as my conversion type and the single event tag as my tracking method. One cool feature of the single event tag is that you can create an audience of the converters. For example, you could exclude the mailing list subscribers from certain campaigns if need be. Once you create the conversion, Twitter will give you a unique snippet of code to place on your site. In the mailing list signup example, you would only want the code to fire when the sign up button is clicked. This is a bit harder to configure, but totally doable in Google Tag Manager and other tag management platforms. 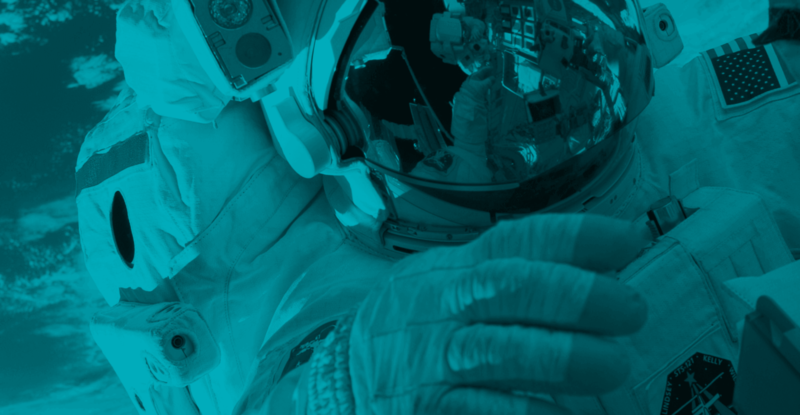 To learn how we can help you best optimize your Twitter ads, reach out today! Also, check out some of our other paid social blog posts to find out more about what Seer is up to.